Commercial pilot Robert Trammell recalls his experience flying a veteran B-17 Flying Fortress for the first time. 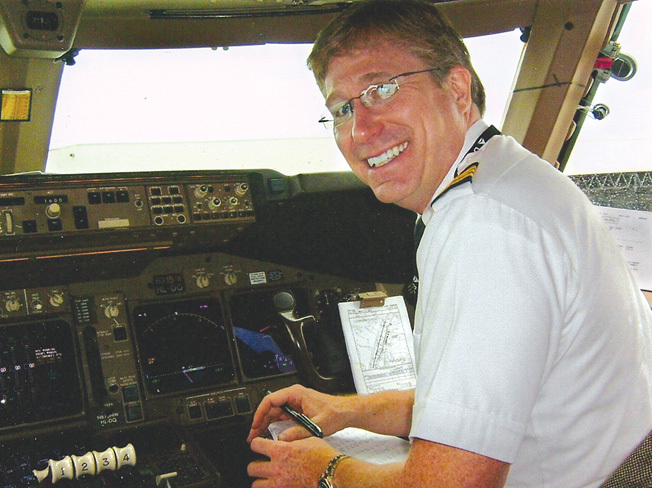 Delta Air Lines and former Northwest pilot Robert Trammell, 45, has made numerous 747 flights on Asian routes across the Pacific. Trammell, of Monroe, Louisiana, has been a pilot for 25 years, logging over 15,000 hours. He’s flown across the North Pole, across Russia, has flown to Europe, Tokyo, Hong Kong, the Philippines. The B-17, named “Nine-O-Nine,” had arrived in Louisiana along with a B-24 and a P-51 Mustang. When invited, Trammell leaped at the chance to ride in an authentic Flying Fortress and to examine the entire aircraft while in flight, from the bombardier’s to the tail-gunner’s positions. I interviewed Trammell an hour after he touched down in Monroe. WILLIAM CAVERLEE: Today, you came into Monroe on a World War II B-17G. Where did you begin the flight? ROBERT TRAMMELL: We flew here from the Talullah/Vicksburg airport near the Mississippi line. It was a fairly short hop from Talullah to Monroe, doing 180 miles per hour at about 2,500 feet. WC: You’re a modern-day, professional airline pilot, and you just logged your first hours in a B-17. RT: Right, in an airplane that flew over Europe, that dropped bombs on Germany, that flew combat missions. To be on such an aircraft was amazing. The first thing that struck me was that these World War II pilots were flying over a continent where they had few navigation aids. For the most part, a sextant, dead reckoning, radio navigation, and the landmarks that they could spot on the ground. Today, I operate by satellite navigation. When I fly over the Pacific, I have satellites, global positioning, and internal navigation systems. We’re in constant radio contact; we know where we are at all times. When those guys were flying their missions in World War II, they were in contact with no one except each other. When they got hit or shot down, they were either dead or prisoners of war. At one point today, I went up into the nose to the bombardier’s seat and looked out and tried to imagine peering down through the Norden bombsight, tried to imagine being in combat. The 21- and 22-year-old kids that flew those airplanes were much, much older than their years. I can’t even imagine doing what they did. 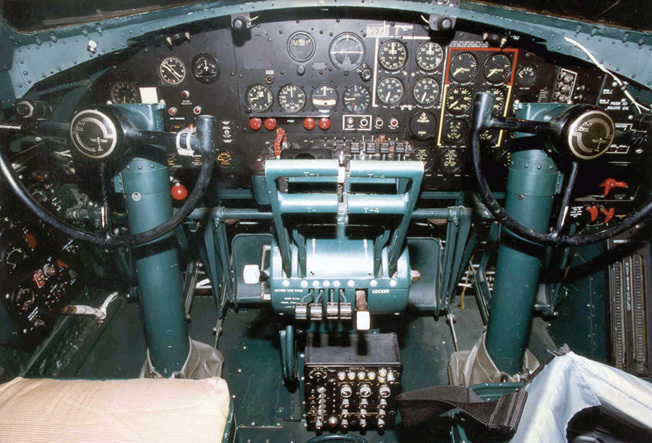 WC: When you were in the pilot’s cabin, looking over the B-17’s instruments, what did you think? RT: How did they do it? That’s all. How did they do it? They had very few instruments to tell them … well, up from down. Nowadays, for instance, we have attitude indicators that have bright colors on them, that have individual degree marks. The B-17 attitude indicator was just a simple white line with a little airplane symbol on it. And the World War II pilots would be flying in the clouds with that! Also, you can’t really hear anything. For 10 hours, under the constant roar of those radial engines, you were deaf by the time you finished one of those missions. WC: And in your 747? RT: We’re cushioned. It’s like being in a rocking chair in your house. When you get in a modern-day airplane, you’ve got the outer skin, the insulation, and the inner skin. You’re sitting up there nice and quiet and you don’t even realize you’re going along at 600 miles per hour. WC: In other words, for you in the front of a 747, you’re not hearing the same roaring noise that we passengers back in coach are hearing? RT: No, not at all. We hear a different sound. We don’t hear the engines—I’ll tell you that—at least not very much. On the B-17, all four of those radial engines are constantly rumbling. A radial engine makes a deep thumping sound. The whole airplane vibrates. A modern airplane doesn’t vibrate like that. WC: Did you feel much turbulence in the B-17? RT: Oh, sure. And when I was standing up trying to walk around, I was constantly banging my head on the ceiling. When you hit your head, you’re hitting sharp edges, cables, and wires. In the B-17, the wires are all exposed. You’re actually bumping into these things. You could even get your hair caught, I realized. WC: What did you notice when you touched the side of the plane, the bare metal? RT: The cold. The rattling. Obviously, you won’t get that in a modern jet because the plane is so well insulated. But in the B-17, when you’re up at altitude, the temperature is minus 50, and, of course if you touch your hand against that bare metal, it will stick. There’s just a thin sheet of aluminum separating you from the outside world. WC: When you were in the pilot’s cabin today, did you recognize the instrument panel? RT: Oh yes, I recognized everything. WC: How about the throttle in the center? RT: Sure, those are standard throttles, controlling the engine speed. You also have mixture controls and prop controls. The World War II pilots had to know how to adjust all three. That’s why, today, the Collings Foundation pilots flew so low to the ground. Because when you keep your mixture rich, and your props at cruise speed, it’s easier to stay close to the ground rather than higher up. During the war, pilots were flying at 25,000 feet and they had to lean the mixture out. When you’re leaning mixtures, you’re basically pulling back until the engine is almost starved of fuel. The air is so thin up there, you can’t have a lot of fuel going through it. WC: In the 747, do you make similar adjustments? RT: In the jets? Oh, it’s all done by computer. The fuel is monitored as we get higher. The higher you go, the less fuel goes in the engine. That’s why airplanes work better at higher altitudes because they’re more fuel efficient. You use less fuel because there’s less oxygen to burn. The cockpit of a B-17. WC: Do you have a yoke in your 747? RT: Yes, there’s a yoke much like the one in the B-17. The Airbuses I’ve flown have joysticks like a fighter. Off to the side, a side stick. But the B-17 is a Boeing product. It’s a little strange to think about it, but today in the B-17, I was simply going from a Boeing product of 2010 to a Boeing product of the 1940s. WC: Now with a yoke, you pull back? RT: Yes, pull back to go up. Push forward to go down. Same as in any airplane. On the B-17, with a turn, though, it’s the ailerons only. On a jet you have spoilers out there that kill lift on a wing in order to help it turn. Well, it’s a little more complicated than I’m making it sound, but, in a way, our ailerons only work at certain times. WC: What did you notice on takeoff and landing? RT: They were pretty much the same as I’m used to. The only surprising thing was that the B-17 rolled much, much slower on takeoff. I said to myself, hey, we’re really creeping across the runway here! Later, at landing, when they put it on the ground, it was nice and soft with those huge tires—two, big, monstrous tires. They’re like balloons. So the landing was nice and easy. The Collings Foundation pilots did a great job. WC: The B-17 is a tail-dragger, right? RT: Oh, nowadays, we all have nose wheels. Everything modern has a nosewheel. Most of the World War II aircraft had tail wheels. Did you notice the B-24 sitting out there today? You could barely see its nose wheel because the framework is all reinforced up in there. And the B-29, of course, had a nose wheel. And those planes definitely steered better. You can see better with a nose wheel. On a tail-dragger, you’ve got to look out over the nose or off to the side when taxiing. But, in a way, the B-17 is easier to land than some planes today. When you fly a 747, you’re not really landing it—it’s landing itself. I mean, yes, I’m sitting up there as pilot, but when the 747’s main gear touches down, I’m still 100 feet in the air. Whereas on the B-17 when you land, you’re maybe 15 feet in the air. You’ve got a lot more feel for landing in a B-17 than in a 747. WC: Of course, when these guys were flying, they were being shot at, too. What was the effect of a piece of shrapnel or a Messerschmitt bullet on a B-17? RT: The Germans actually had cannons on their fighters. They had two machine guns and one cannon. At least the 109s did, I think. Because the Germans believed in that large cannon shell for bringing something down. And the shells would just go right through if it didn’t hit something. Just right through the sheet metal. The aluminum on a B-17 is probably about the thickness of 10 sheets of paper. In other words, there’s not much there. WC: Now the theory, from my history reading, is that the B-17 was so well armed it was supposed to be a defensive weapon as well as a bomber. RT: It was supposed to be. WC: But nothing stops a piece of shrapnel. RT: You can’t stop shrapnel or cannon fire. When a Messerschmitt is gaining on you at 400 miles an hour, it’s an extremely hard target to lead. That’s why it was so difficult to shoot a fighter down by machine-gun fire from a B-17. You’re shooting a .50 caliber gun that has a rate of fire of, what, 600 rounds a minute? And you’ve got, I think, 500 rounds per gun, so you have about a minute’s worth of ammunition to fly a 10-hour mission with. WC: We were both in the B-17 a little while ago, in the nose, where the bombardier and navigator were sitting, and it looked like there were oxygen lines and cables going everywhere. RT: Yes, you saw control cables for the rudders, for the ailerons, and the elevator. WC: These are all mechanical? RT: Yes, they’re connected to the wings and the tail. They’re running all the way through the interior of the aircraft. Delta Airlines pilot Robert Trammell in his usual “office”—the cockpit of a Boeing 747-400. WC: How about computerized hydraulics? RT: Not on the B-17. I believe that only the wheels and the ball turret had hydraulics. WC: Otherwise, it was just mechanical cables? RT: Correct. Whereas on the 747, it’s all hydraulic. WC: How many backup systems do you have on your 747? RT: Several. It just depends. WC: What about the B-17? RT: There were no backups at all! That’s it. When you see pictures of those airplanes coming in with a chunk of the tail missing, they were coming back on sheer skill . . . and luck. Plus, if you’re over a combat zone, you have the noise and chaos of the machine guns firing, and the entire crew yelling over the headsets. As I said, I’m stunned to think of what they went through. WC: And they were freezing. RT: Yes, they were freezing to death on top of all that. RT: Yes! Those guys were in their sheepskin suits. And the suits were supposed to be heated, but I’ve always heard that the heaters malfunctioned. They didn’t work that well. WC: And how about the navigator? How did he do his work wearing gloves? RT: He had to pull his gloves off to calculate his positions. WC: And many of those navigators were trained right here at Selman Field in Monroe, Louisiana, right? RT: Exactly. This was the largest navigation school in the country during World War II. Over 15,000 officers received their commissions here and went on to fly in both theaters of the war. WC: Did the pilots of the B-17s have detailed knowledge of their planes? RT: Oh, they really knew everything back then. Those guys had to know the ins and outs of every inch of that airplane. WC: Back to the instruments that they had in 1940. Were these just basic navigational, operational instruments? RT: Right. Pitot-static tubes. In a sense, we still operate under the same principles. We still have Pitot-static instruments today but the inputs go into a computer and the data comes up on computer screens for us to see, whereas these guys were getting raw information, and they were having to correct for … well, everything. It’s so rudimentary, so basic. And, of course, the pilots didn’t have anything to navigate with; they were strictly flying the airplane, and the navigator was telling them where to go. And imagine that navigator; he’s having to identify cities on the ground or else use the stars. And that’s the only way he had to get to a destination; that and dead reckoning. Just flying at a certain speed for a certain time and hoping you arrive at the right place. WC: Did you walk through the whole airplane? RT: I did. That was the main reason I took the flight. I wanted to get a feel of what it was like to move up and down the airplane during flight. I roamed from the pilot’s compartment to the top-gunner to the waist-gunners to the tail. And I was surprised to see how small the interior of the airplane was. In places, a person could actually touch both sides. I’m six feet tall and I had to bend over everywhere while going through. WC: You couldn’t stand up? RT: No, I couldn’t stand up anywhere in the airplane, except in the radio operator’s hatch. RT: You were hunched down the whole time. Those guys were continuously in a squat. But your adrenaline was running. You’re not really thinking of anything. And time speeds up, I’ve read, when you’re in combat. WC: And the ball turret? RT: I tried to look inside, but the Collings Foundation pilots had it wired shut for safety reasons. Strange, but it didn’t really look like anything was holding the ball turret in there. WC: But there’s a cradle holding it in place, right? 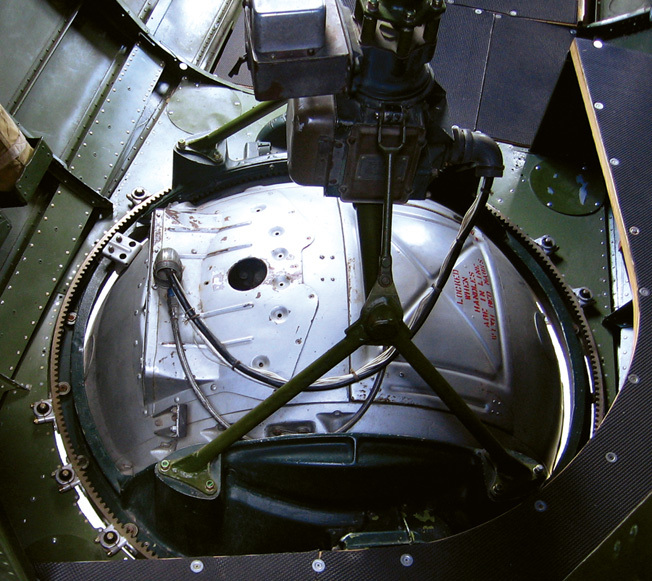 Looking down on the hatch cover of the B-17’s ball turret. WC: Could you have gotten into it at six feet tall? RT: It would have been tight. I don’t think I could. That was another way in World War II that a lot of guys died. If a ball-turret gunner were wounded, sometimes they couldn’t get the hatch open to get the guy out. If the hatch got jammed, or if they had a wheel shot out, or the landing gear was damaged, the ball turret gunner just … died. My dad was telling me about a friend of his in World War II. On one mission, the ball-turret gunner became trapped and the airplane was making a belly landing. And my dad’s friend and the whole crew talked to the gunner all the way down, until they heard him screaming over the intercom, and then they had to unplug their intercoms. As a modern pilot today, I can’t even imagine that. Because, in many ways, I’m completely isolated. Even though I’m in the air and I’m still dealing with everything they did, the weather, landing on instruments, and things like that. I’m not getting shot at. I’m not in an airplane that’s just your basic flying machine. WC: Just a thin metal skin? RT: Right, just a metal skin designed to carry bombs. There’s no comfort at all. WC: And in your 747, you’re nice and warm? RT: Yes. I even have a restroom I can go to. WC: Today, when we looked from the nose back toward the rear of the B-17, there was a little passageway that you had to literally crawl on your hands and knees through to get to the bomb bay, which was the next thing you saw. RT: Right, it’s in the center of the airplane. It’s not that long either, around six feet. And there’s only a little six-inch-wide passageway to walk through between the racks of bombs. WC: Did you go back to the tail gun? RT: No, that was blocked off. But I don’t think I could have gotten into the tail, either. I’d say the tallest you could be was about 5’5” to get in some of these places. And not broad-shouldered. You definitely had to be a little guy to get back into these crawl spaces. Trammell poses with one of the .50-caliber waist guns. Note the narrowness of the fuselage. WC: How many engines did they need to come home on? RT: I’ve heard of them coming back on one. Skimming across the English Channel. I’ve heard of it being done. Dumping everything, burning the engines off, coming back on one. But the yaw had to be incredible. RT: The twisting of the airplane. WC: The back and the front? RT: Right. When you’re in training, they teach you all that, how to operate when you lose one engine, what it’s going to feel like, but even so, the rudder can’t compensate, with only one engine turning. WC: I once asked a private pilot about the World War I radial engines and he said that the rear of the plane tries to get in front. RT: Right, that’s called torque and P-factor, because, of course, for every action there’s an equal and opposite reaction, and, with the propellers twisting, the airplane is trying to turn a certain way. That’s why you often hear the term “right rudder.” The torque is causing the airplane to turn to the left and so you have to push in on that right rudder to keep it from yawing. WC: What about the four Wright-Cyclone engines on the B-17? RT: Well, with all of them working you don’t have the same torque effect that you have on a single-engine airplane like the P-51. 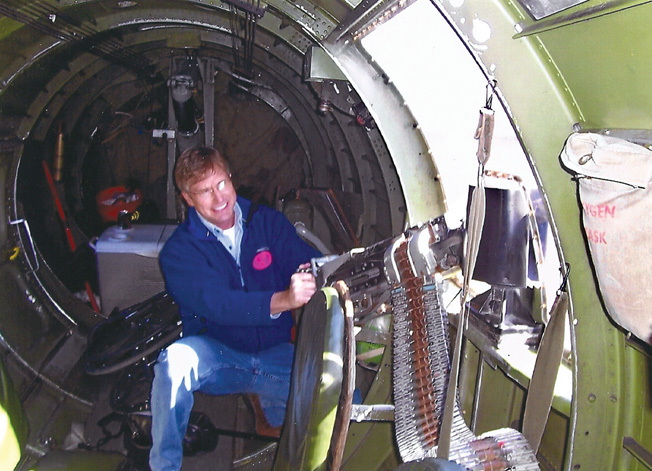 On the B-17, what you have to worry about is when you lose an engine. At that point, you have the yaw coming in. The P-51 takes a lot of right rudder on takeoff to compensate for the unbelievable torque of the propeller, whereas the four B-17 engines counteract each other. WC: Today, when you saw the Collings Foundation pilot start the engines, did he start with the No. 1? RT: Yes, he started with No. 1 and worked his way across. Well, actually, this morning, they had smoke coming off the No. 3, so they had to crank it first and then start the other three and then they taxied the airplane and took a brief flight to make sure there wasn’t going to be a fire or anything before we boarded it. So we boarded with all four engines running. We came up from behind, with all the engines running and the wind hitting us like a storm. An interesting moment. WC: In your 747, what is the standard crew? RT: We have two copilots and two captains. We have two sets of pilots. One crew flies half the time and then the other crew will come in and fly the rest. 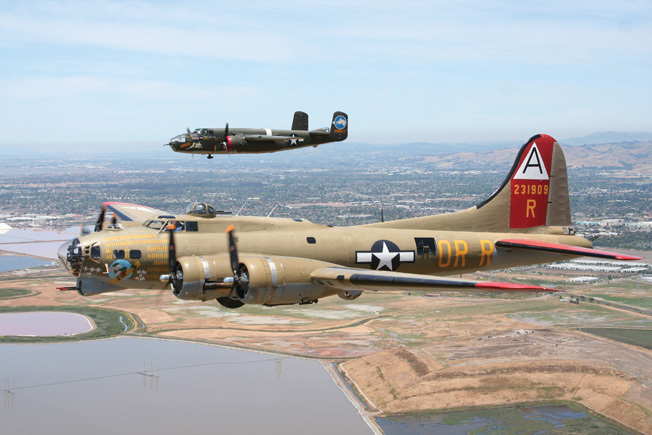 Of course, in World War II on the B-17, the two pilots flew for 10 or 12 hours straight. 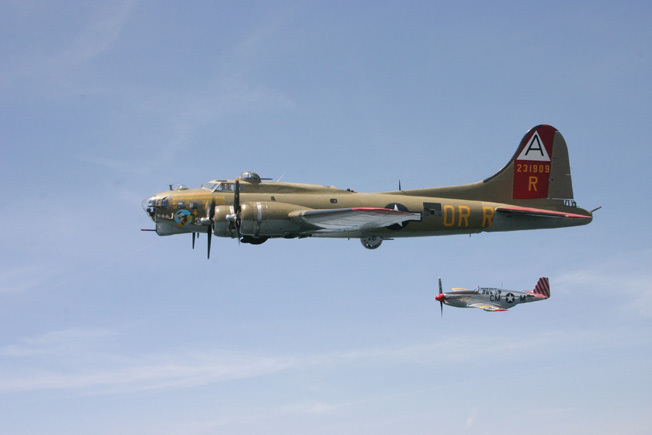 The B-17 “Nine-O-Nine” and the P-51C Mustang “Betty Jane” in flight. WC: So, no relief pilots on the B-17? RT: No time for sleep there! They were too busy being shot to pieces. I’m still stunned to think of those pilots in the B-17. That was real flying. You were in touch with everything. When you’ve got cables running to the control surface and your yoke is cocked a little bit because the cables are stretched and you’re trying to bump it with the yoke to keep it straight—now that’s flying. When I’m in the 747, the yoke is always perfectly straight, the rudders are always true, everything is right where it should be. But when you’re in a B-17, those cables get stretched, the airplane gets a little bent. It’s all up to you to keep the airplane in the air. WC: So today, as a professional, commercial pilot, you were getting a rare look at this airplane from the 1940s? RT: I cannot fully describe the thrill. I didn’t imagine it would be such a thrill. After flying for 25 years, for over 15,000 hours, I didn’t think I could get this excited about being in an airplane. And I did. Just to see and imagine flying a B-17 in the 1940s gave me a new insight about aviation, a new appreciation of what those airmen did back in World War II. Tags Allies, Boeing 747, Boeing B-17 Flying Fortress, Douglas C-47, English Channel, memoir, Norden bombsight, robert trammell.